The second volume of a limited two-volume set collecting the Basil Copper Solar Pons adventures. Release date is February 2017 from PS Publishing. Basil never had the pleasure of seeing all his Pons stories collected in a definitive omnibus edition. However, before his death in April 2013 at the age of 89, he and I started working on these two volumes. I also wanted to collect all his macabre fiction together and, with the help of PS Publishing, we did just that in 2010. Two years later we collaborated again to publish Basil’s Gothic novel The Curse of the Fleers in a version that the author originally intended. Although it saddens me that he never lived to see this handsome presentation of his entire Solar Pons Canon from the same imprint, I’m also heartened to know he was aware that we were working on it. 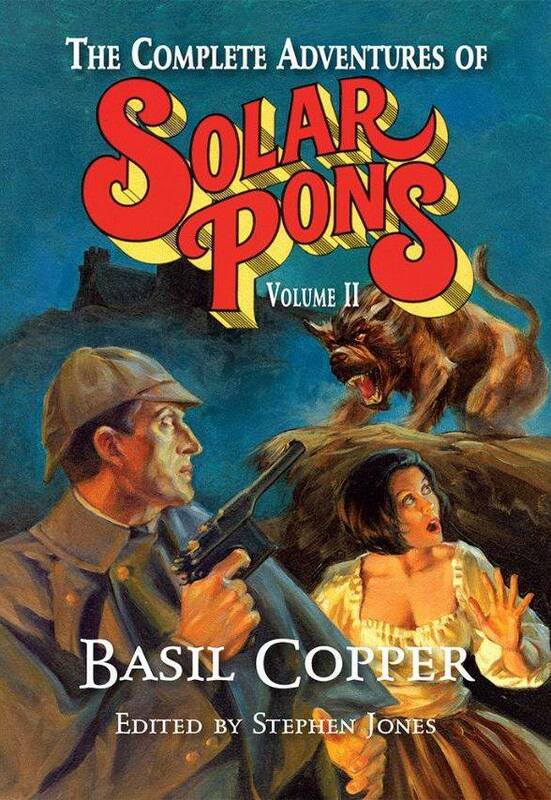 It has taken forty years but here, finally, are The Complete Adventures of Solar Pons by Basil Copper. Once again prepare to be plunged into an idyllic English countryside or the chill and foggy streets of London, as that great city’s second most famous consulting detective—ably supported by the reliable Dr. Lyndon Parker—uses his “ratiocinative” powers of logical deduction to solve murders both mysterious and macabre . . . THE EXPLOITS OF SOLAR PONS; The Adventure of the Verger’s Thumb, The Adventure of the Phantom Face, Death at the Metropole, The Adventure of the Callous Colonel. THE RECOLLECTIONS OF SOLAR PONS; The Adventure of the Cursed Curator, The Adventure of the Hound of Hell, The Adventure of the Mad Millionaire, The Adventure of the Devil’s Claw. THE SOLAR PONS COMPANION; Foreword, In the Footsteps of Sherlock Holmes, Plots of the Stories, Characters in the Stories, The Sayings of Solar Pons, Solar Pons Plot and Dialogue Notes (Stephen Jones), The Adventure of the Northleach Stocks (Stephen Jones), Painting Pons: Artist Ben Stahl (Stephen Jones). THE FINAL CASES; The Adventure of the Defeated Doctor, The Adventure of the Agonised Actor, The Adventure of the Persecuted Painter.